David Duong's family had to be rescued at sea after fleeing Vietnam in a small boat at the end of the war. 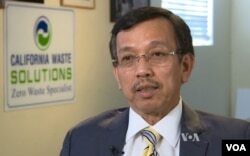 Duong's company, California Waste Solutions, operates in Oakland and San Jose, California. It has fleets of specialized trucks that cost about $300,000 each that go out at dawn to collect recyclable materials. Thousands of tons of material are brought to the company's large, complex, highly automated sorting plants. It is a huge evolution for a company that began when Duong's new immigrant family desperately needed work and money and started picking up cardboard on the streets of nearby San Francisco. "We almost died in the ocean because the engine broke, and we have to be out there the boat just floating," Duong says. Duong's father scraped together a $700 down payment on a used truck. But as a new arrival with no credit history, he had trouble borrowing the rest of the money for the truck. David Duong says his dad "went to Chinatown to a Chinese church and asked for help. And people know us and they help us ... so we can go around and pick up recyclable material and sell, and that's how we started." Many machines now do the sorting that Duong's family once did by hand. At Duong's recycling facility, employees and complex machines now do the sorting his family once did by hand. It is also good for the environment, said Chief Operating Officer Joel Corona, who says the goal is to send "zero waste" to California's landfills. Duong says Vietnam's government is making it easier to invest there, which could encourage some overseas Vietnamese to overcome lingering anger and start new ventures in the old country. "We can take the technology that we learned, we do it here in the U.S., bring it back to our hometown and be able to help the people of Vietnam and help the environment, and those are things I'm just so proud," he says.